Mill-Max has added a second version to our 829 series single-row, right-angle, spring-loaded connectors. The new connector, 829-22-0XX-20-002101, has an increased mid-stroke distance of .045" (.090" full stroke) - close to double most standard series products and providing more flexibility and tolerance for your assembly. Both versions of the 829 series are the perfect solution for applications calling for a spring-loaded connection that lies parallel to the PC board. 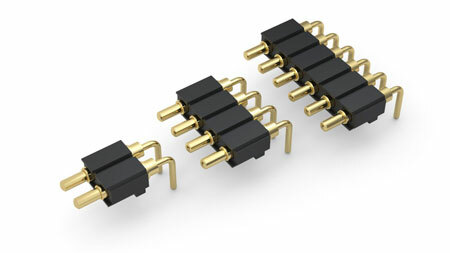 Spring-loaded connectors (SLC) are commonly used to provide a high quality battery interface connection and in applications such as board-to-board interconnects and blind mate assemblies. These low profile, right angle connectors are ideal for the small packaging requirements of hand-held devices, especially where vertical space is limited. With tails bent at right-angles and locating pegs on the insulator, the 829 series connectors are installed as through-hole components providing a secure connection to the PC board. These SLC's are suitable for hand, intrusive reflow or wave soldering. Gold-plated brass components and beryllium copper springs ensure the highest conductivity, corrosion resistance and durability. The 829 series connectors feature spring-loaded pins rated at 2 amps continuous (3 amps maximum), use high temperature Nylon 46 insulators and are offered in up to 20 positions in a strip.